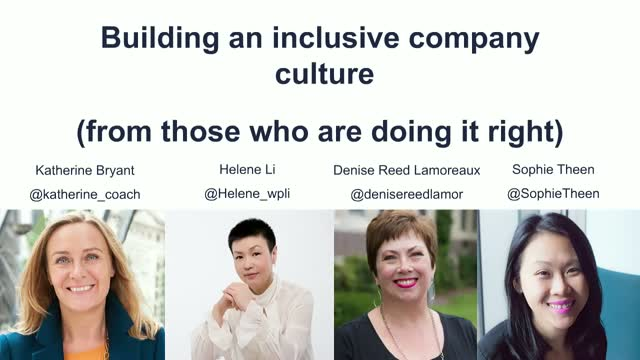 We've brought together professionals from various industries who will share how they have created an inclusive company culture and how you can too. Denise Reed Lamoreaux is the Global Chief Diversity Officer at Atos, leading a staff focused on providing a safe, equitable, inclusive environment for our 120,000 employees in 72 countries, with emphasis on balancing our workforce; equipping our leaders with knowledge and information on how to work with a diverse staff and harness creativity; creating opportunities for our employees to develop and advance; attracting talent from all representative groups; and positioning Atos as an ethical, inclusive, and trustworthy partner in the marketplace. Having worked in the ultra-high-net-worth space for most of her banking and consulting career, Helene is committed to leveraging the financial power and heart of the 1% to accelerate the impact in helping the 99%. It is in this spirit that she co-founded GoImpact as an action driven ecosystem to connect stakeholders in accelerating the Impact momentum.